Sunday 23rd October arrived and what a day. Rudely woken by Kathryn who was equally buzzing and decided she must have a shower at 5.30, I was full of anticipation about my challenge – the run. After having a breakfast of porridge and picture taken with Kathryn (had forgiven her by then for waking me up but was I going to forgive her for the challenge! ), I was ready for the off. Portsmouth is easily reached by a nice little ferry journey. On the way to catch it, the local radio was already in the spirit of the run and they played Justin Timberlake’s Can’t Stop the Feeling which certainly got me in the mood for the run. By the time I was sat on the ferry, full of other runners, I was so excited. I was not going to be a fast runner but at 50 years old, I was so determined that I was going to do this at my own pace. Warm up for all of us runners going over by ferry is a 25 minute beautiful walk to the starting line. The day was a little chilly but otherwise perfect conditions. Apart from doing two park runs, I had never run in an event before so hearing another runner saying she hadn’t even run a 5k race before did make me smile. Normally a spectator; Chris having completed two runs and Kathryn doing her first one last year; it was very different for me this year. Kathryn was starting half an hour before me so I tried to see her on the starting line but with no luck. After her wave was off, the half hour went very quickly and I was soon warming up with Justin Timberlake’s song again and then it was off. With the sun shining, the run along Southsea seafront was amazing. Straight away, I had that feeling that I was going to run all the way although I had to make a quick stop because my lace had come undone. I never normally have that problem. I had read that it was a good idea to dedicate laps to family or friends to help you complete them. I didn’t plan for all of them but being a local girl, I did have a few that I was running for. The 2nd mile was for Mum, Dad and my brother Tony as I remember going into the pub along that route with Dad when my sister was born. Ironically my Mum’s favourite song, Is this the way to Amarillo, came on just at the start of the mile so that gave me all the encouragement I needed. 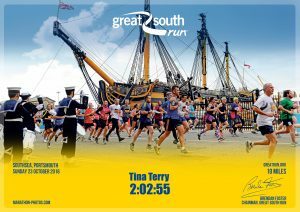 The race takes you through the Historic Dockyard which was wonderful and you have so many bands playing along the way. I also managed to see family and friends and wave to them. I had a plan that I would love to get to 6 miles before I did any walking but I had already decided that was not going to happen and I was going to run all the way. More encouragement with my music came as I was approaching the 7th mile, which was the longest I had run before, when Candyman by Christina Aguilera came on. A zumba song so I had to dedicate that lap to the zumba ladies. There was so much about the day that was memorable and I don’t think I will ever forget the supporters. There was music being played from houses and people waving. The weather was amazing and normally the last few miles are tough because of the wind but that was also on my side. 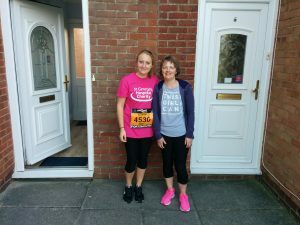 I carried on running and I can’t believe how quick the final mile felt. I think that was due to Wham’s Everything She Wants blaring out of speakers and knowing that I had achieved what I had come out to do. 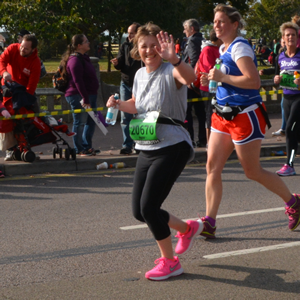 I had a huge smile on my face approaching the finish line and managed to wave to Kathryn who had been waiting some time. I crossed the line and could not believe that I had just run 10 miles. I collected my goodie bag and made my way to the exit to meet up with the family. I did feel the impact of the run here and ached in places I had never before but the feeling I had from my achievement made it all worthwhile.